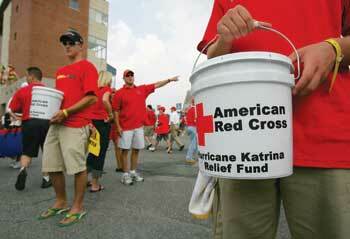 The Bucket Stops Here: Relief efforts like this one last month, where University of Maryland student athletes volunteered to collect donations for the American Red Cross Hurricane Katrina Relief Fund, are well-meaning. But they're just one more step in the privatization of despair. HURRICANE KATRINA has prompted Americans to donate more than $700 million to charity, reports the Chronicle of Philanthropy. So many suckers, so little foresight. Government has been shirking its basic responsibilities since the '80s, when Ronald Reagan sold us his belief that the sick, poor and unlucky should no longer count on "big government" to help them, but should rather live and die at the whim of contributors to private charities. The Katrina disaster, whose total damage estimate has risen from $100 to $125 billion, marks the culmination of Reagan's privatization of despair. The American Red Cross leads the post-Katrina sweepstakes, quickly closing in on the $534 million it took in just after 9/11. But Red Cross spokeswoman Sheila Graham told the Associated Press it needs another half billion "to provide emergency relief over the coming weeks for thousands of evacuees who have scattered among 675 of its shelters in 23 states." Shelley Borysiewicz of Catholic Charities USA, which has raised $7 million thus far, also continues to solicit donations: "We don't want people to lose sight of the fact that this is going to take years of recovery, and we're going to be there to help the people who fall through the cracks." What "cracks"? Why should New Orleans' dispossessed have to live in private shelters? We live in the United States, not Mali. There's only one reason flood victims aren't getting help from the government: because the government refuses to help them. The Red Cross and its cohorts are letting lazy, incompetent and corrupt politicians off the hook, and so are their donors. It's ridiculous, but people evidently need to be reminded that the United States is not only the world's wealthiest nation but the wealthiest society that has existed anywhere, ever. The U.S. government can easily pick up the tab for people inconvenienced by bad weather—if helping them is a priority. That goes double for Katrina, a disaster caused by the government's conscious decision to eliminate the $50 million pittance needed to improve New Orleans' levees. For our leaders the optional war against Iraq is such a priority, which the Congressional Budget Office expects to cost $600 billion by 2010. That's four or five Katrinas right there. (That's also where the levee money went.) Because rich people are always a political priority, their taxes have been slashed by $4 trillion over a decade—the equivalent of 32 Katrinas. So worried are our public servants about the tax burden placed on the rich that they're looking out for rich dead people. This is why they've gutted the estate tax that, at a cost of $75 billion annually, will run half a Katrina a year. Trickle-down economists beginning with Milton Friedman shout "starve the beast," but while the social programs are put on a diet, the mean and powerful pig out more than ever. Disaster relief is too important to be left to private fundraisers, with their self-sustaining fundraising expenses, administrative overhead (9 percent for the Red Cross) and their parochial, often religious, agendas. It's also way too expensive. In the final analysis, after the poor neighborhoods of New Orleans have been razed under eminent domain, major charities will be lucky if they've managed to raise 1 percent of the total cost of Katrina. Congress, recognizing the reality that only the federal government possesses the means to deal with the calamity, has already allocated $58 billion—over 70 times the amount raised by charities—to flood relief along the Gulf of Mexico. As Bush says, that's only a "down payment." Cutting a check to the Red Cross isn't just a vote for irresponsible government. It's a drop in the bucket compared to what you'll end up paying for Katrina in increased taxes. Granted, in terms of popularity of likelihood of success, trying to make a case against giving money to charities compares to lobbying against puppies. The impulse to donate, after all, is rooted in our best human traits. As we watched New Orleanians die of thirst, disease and anarchic violence in the face of Bush administration disinterest and local government incompetence, millions of us did the only thing we thought we could to do to help: cut a check or click a PayPal button. Tragically, that generosity feeds into the mind-set of the sinister ideologues who argue that government shouldn't help people—the very mind-set that caused the levee break that turned Katrina into a holocaust and led to official unresponsiveness. And it is already setting the stage for the next avoidable disaster. It's time to "starve the beast": private charities used by the government to justify the abdication of its duties to its citizens.